Fourth Row Center: Film Writings by Jason Bailey: On DVD: "Mystery Science Theater 3000, Vol. XXIII"
This new set (the eleventh since Shout Factory took over the releases from Rhino) is a strong sampling from the show, offering a two-Joel, two-Mike mix, with episodes from the second, third, and sixth seasons. Shout spent several sets insisting on including episodes from the inferior first season, before the show had hit its stride; they’ve backed off of that over the last few releases. The earliest episode here, the second season effort King Dinosaur, finds the show doing what it does best: destroying a grade-Z sci-fi clunker, with a dopey educational short decimated for good measure. 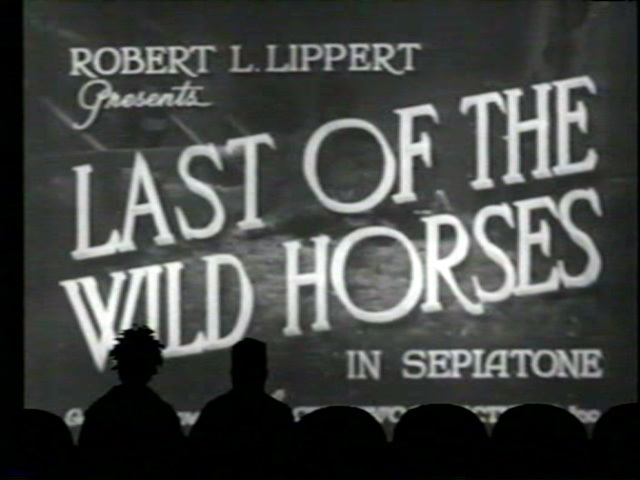 The name of King Dinosaur producer Robert Lippert causes crying and screaming from Joel and the ‘bots, and for good reason; he was already responsible for three previous movies in season two (and one in season one). King Dinosaur is a typical Lippert cheapie, in which a pair of male and female scientist couples go on an expedition to “Planet Nova,” which looks suspiciously like some empty land owned by someone Lippert knew (Servo cracks, “Guys, I think they landed in Wisconsin”). While there, the encounter exotic animals, and even dinosaurs—all in stock footage, of course (when one character says he saw a lake, Crow replies “I think you mean you saw a clip of a lake”). In a host segment, Joel introduces the secondary character of “Joey the Lemur,” prompting a maddeningly catchy song and plenty of jokes during the movie itself (“Well, we’re getting a lot of mileage out of that lemur bit”)—which is helpful, since it is so glacially paced that the riffing goes in some particularly odd (and entertaining) directions. Overall, it’s a first-rate episode—this is the kind of film that the show always ripped well, particularly in earlier seasons—with some especially good bits for Crow, who amusingly stays behind at the end of the short to listen to the judge’s big speech (murmuring in agreement throughout), before coming out for a very funny host segment about how to be a better citizen (“Crush someone with an emotional word or enigmatic look”). The Castle of Fu Manchu, though frequently funny, is probably the weakest episode of the box; I had seen it before but had forgotten most of it, simply because the movie itself is so incomprehensible that the guys, at times, don’t seem sure what the hell to do with it. They’re well aware of how awful it is; in the introduction, Dr. Forrester says it “makes The Unearthly look like Citizen Kane.” And there’s plenty of good lines, most of them about the picture’s incompetence. Crow, at one point, despairs, “Wouldn’t it be great if we knew who they were, where they are, what they’re doing…”; when the title character (Christopher Lee) purrs “I need him conscious and coherent,” Servo snaps, “I WISH THIS MOVIE WAS CONSCIOUS AND COHERANT.” Their best joke, ultimately, is about how close the picture comes to breaking them, and while that’s a good gag, it can only go so far. Still, it’s by no means a bad episode. The first Mike Nelson-fronted show in the set is Code Name: Diamond Head, a failed pilot that was shown as a TV movie. But first is one of their all-time greatest shorts, “A Day at the Fair,” in which a farm family (“No one can explain why father is 85”) heads off to the state fair, where they take in cake and grain juggling, livestock competitions, a display of butterflies (Crow: “Later the moths turn up in the mouths of Bob’s victims”), rides on the midway (“You’ve spent your nickel, we’re done”) and horse races (“C’mon, you chunk of dog food, I’ve got a year’s allowance on you!”) Compact and hilarious, this is exactly the kind of who-the-hell-was-this-for short that the show skewers so well—every line lands. The feature, from venerable TV producer Quinn Martin (Crow notes, “Quinn Martin considered this his most personal film”) is surprisingly—or maybe not—the work of director Jeanott Szwarc, who would helm Jaws 2 the following year and go on to do Supergirl and Santa Claus: The Movie. A Hawaii-set detective series, it features “guest star” Ian McShane, but since the episode first aired in 1994, we get Lovejoy jokes (too many of them, if we’re being honest) rather than Deadwood jokes. The 1970s décor, music, and costumes are ripe targets—there are bellbottom gags galore, along with Servo’s insistence that “this is so almost Mitchell,” to which Crow replies, “It’s about fifty pounds short of Mitchell”—as are its TV roots (Mike cracks, “When this originally aired, by this point everyone had turned to Carter Country”). The episode only falls short in the host segments, which are mostly spoof variations on This Boy’s Life that don’t really play. Finishing out the set is Last of the Wild Horses, one of my favorite later episodes merely due to its ingenious and unusual premise: early on, Dr. Forrester sends a “matter transference device” to the Satellite of Love during an “ion storm,” causing the show to flip into an “alternate universe” where Mike and the ‘bots are in Deep 13, and Dr. F and Frank are on the satellite. And thus, contrary to the end of Fu Manchu, the “Mads” get to go into theater for the first segment of this Lippert Western and—seated on the left side—riff it with skill and ease. Dr. F dubs composer Albert Glasser “the man who holds you down and pummels you with music”; the pair begin a running gag that continues through the episode of tacking “of the Ooooooold West!” onto the end of just about anything, i.e. “Foot fetishists of the Ooooooold West!”, “Middle management of the of the Ooooooold West!”, and “Ungodly coincidences of the Ooooooold West!” There’s even a return of the “Joey the Lemur” song, which says to me that someone at Shout deserves a gold star for assembling this particular combination of episodes. The only problem is that they switch back too quickly; the “Mads” are only in the theater for the first section of the movie, which feels like a slightly missed opportunity. Shout has continued to do right by Mystery Science Theater 3000 with this new set; MST3K XXIII is a well-curated collection of episodes, bolstered by a batch of new and outstanding bonus features. With nary a weak episode in the bunch, this is one of the best MST box sets to date. "Mystery Science Theatre 3000: Volume XIII" is out tomorrow on DVD. For full A/V and bonus feature details, read this review on DVD Talk.
" Shout spent several sets insisting on including episodes from the inferior first season, before the show had hit its stride"
Oh, please. Those episodes really aren't all that good, but SOME people would like to own every episode in the best quality possible regardless of the overall quality. They had to release them at some point you know. They've only got five left from that season, might as well get it over with (assuming they can get the rights to them).